Can you believe we are to fall? 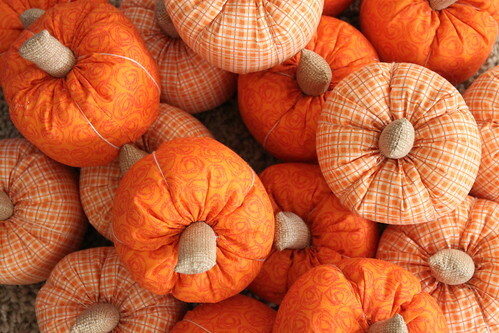 Do you remember these fun Fabric Pumpkins from last year? I thought I would share the tutorial again this year...but, early enough that you might actually make some. 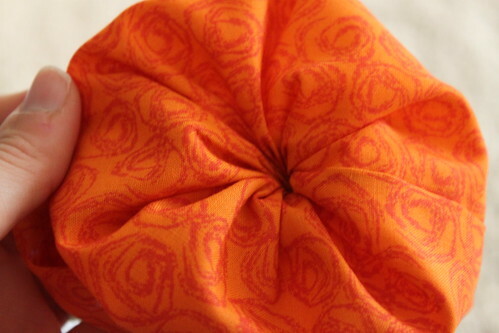 I am sure I will be making a few to sell at the small boutique I am helping to put on. And, a few more just for fun...or to give to the neighbors...or to someone. I just know I love making them! Really, who wouldn't want these cuties in their home? Mine are a little more rustic country looking...but I have made some out of more decorative fancy fabrics and tied a ribbon on them instead of raffia and those are fabulous too. 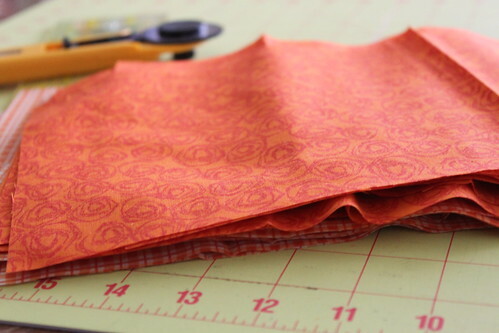 So, find what fabric you love...and make one or two...or 24. 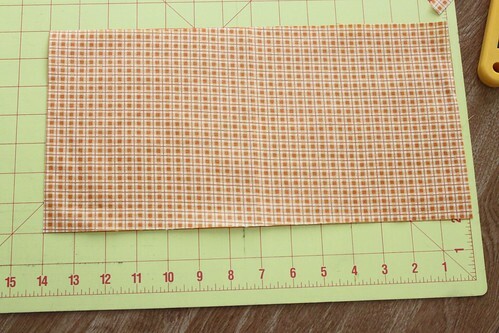 You are going to cut out a a piece of fabric that is 7" X 14" (small size) or 9"x18" (Medium size) or 11"x22" (large size). 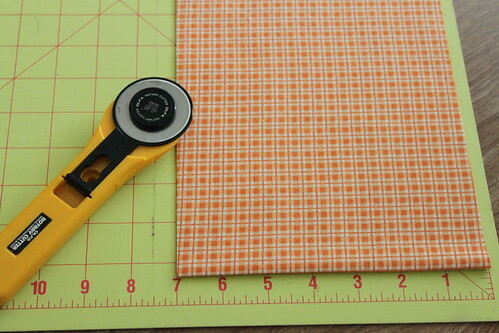 Or basically you can cut whatever size you want you just double the length of whatever your width is. Here are all of mine ready to go. Next, you are going to make a tube. 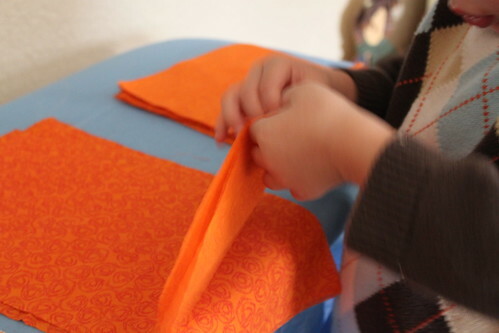 So, I had my cute little helper fold all of the pieces together for me. Make sure right sides are together. 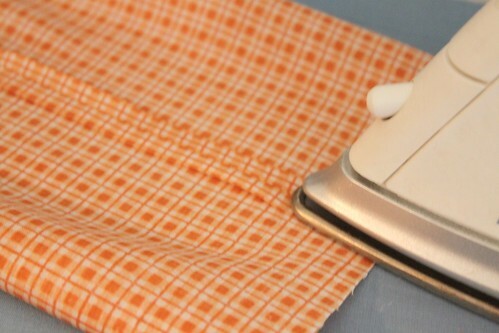 Then with your sewing machine sew down the side. This will create your tube. 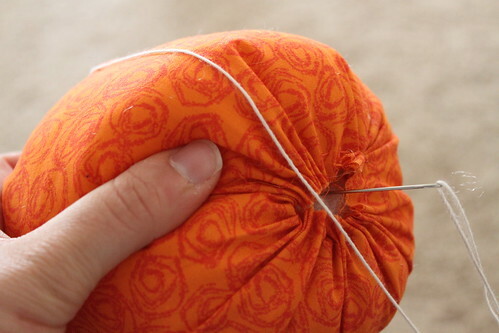 Then grab your needle and thread (I double my thread to make it stronger), and gather all along the bottom of of the tube. It should look like this when you are done. Tie off the end. 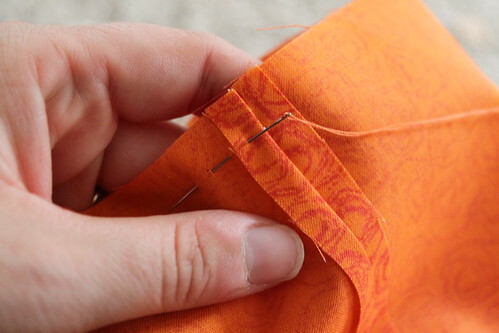 Turn the fabric right side out. 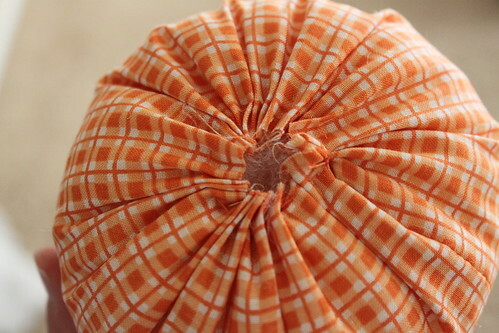 This is what your bottom should look like. Fill it up with fiber fill. You want them to be really full of fiber fill. They look much better if they are stuffed really good. More is better. Trust me. 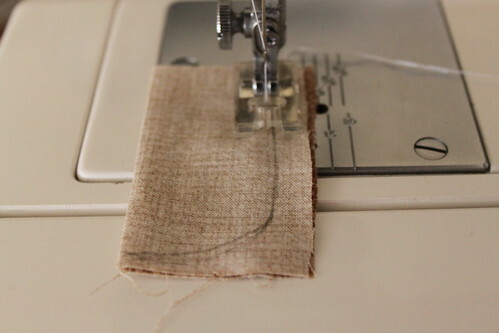 Then grab your needle and thread again and gather the top. This time you don't want it quite as tight. You are going to put your stem into the top, so you want it a little loser. 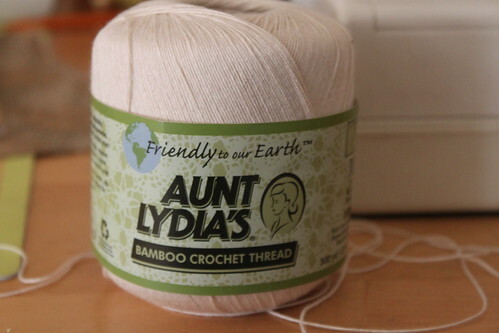 Next get your crochet thread. 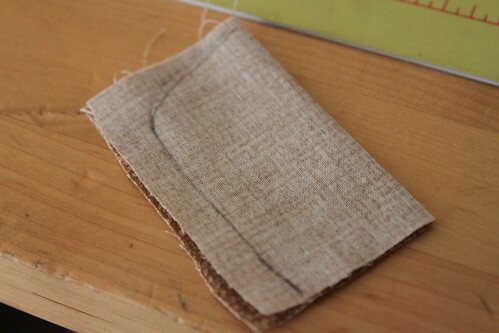 Or you can use regular thread or thing jute or something like that. I like different crochet thread. This is what I bought this time. 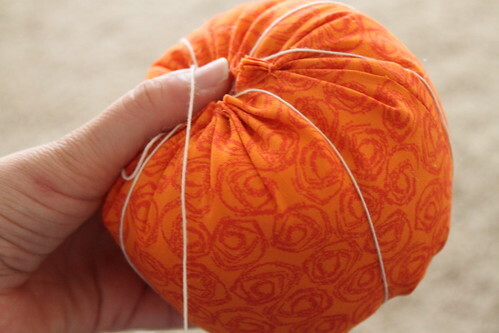 In order to know how much crochet thread to use I wrap it around my pumpkin 3 times like this and then add a little extra. You don't want too little...but you don't want too much. This has worked for me. 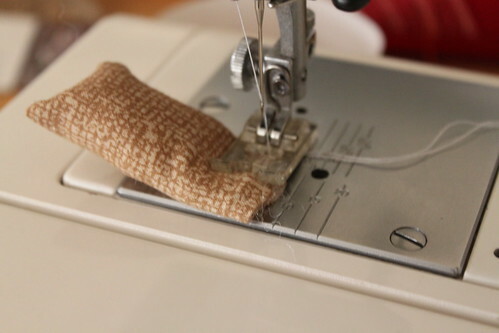 Thread it onto a big needle. 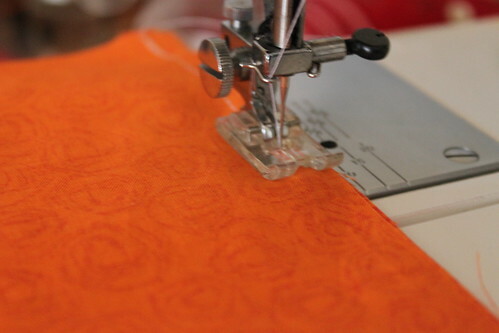 You need it to have large eye on the needle and to be a long needle. 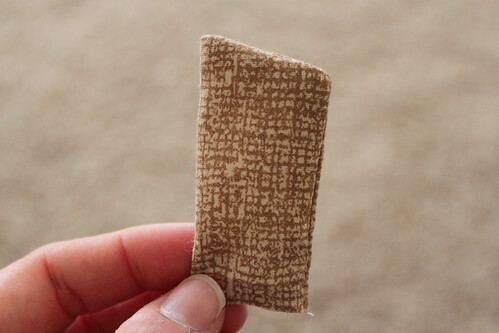 Put a knot on the end. 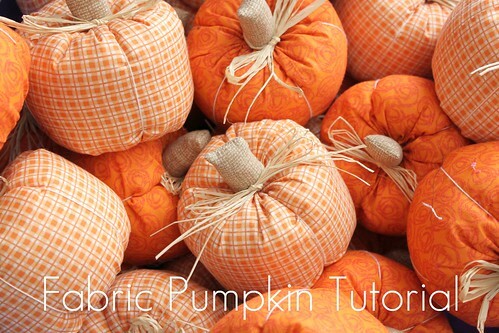 Start by going through the top down into the bottom of the pumpkin. 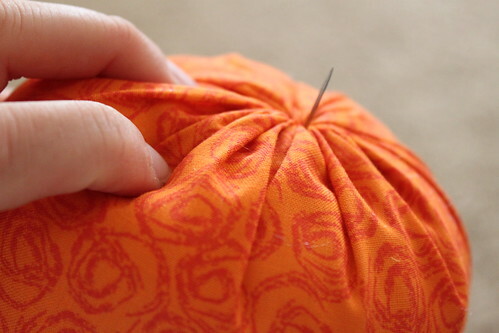 This puts your knot inside the pumpkin. See push is through the bottom like this. Then you are going bring up back up to the top like this and then down through the pumpkin again. I do it 5 times. It will look like this when you are done. 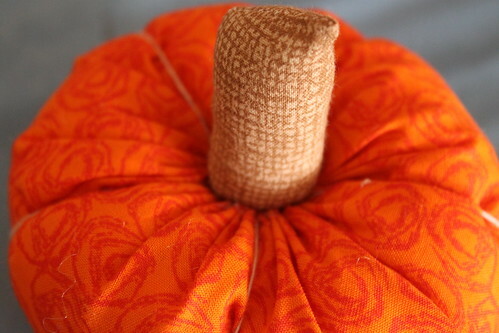 (This is the top of the pumpkin.) 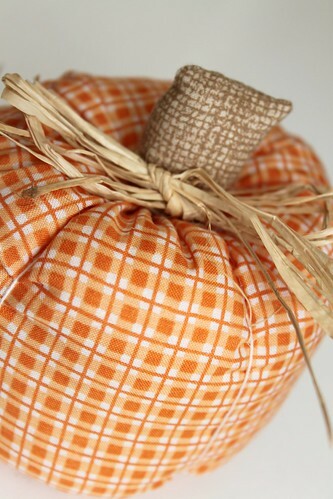 Tie it off on the bottom of the pumpkin. 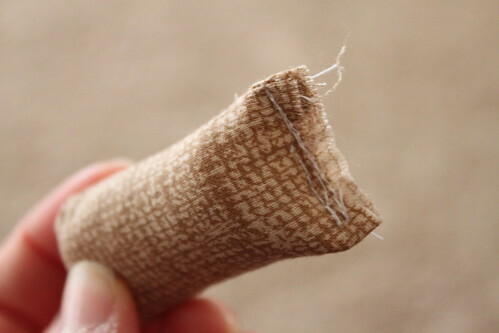 To make the stem grab a scrap piece of fabric. Mine was about 3" x 2 1/2" -"3". 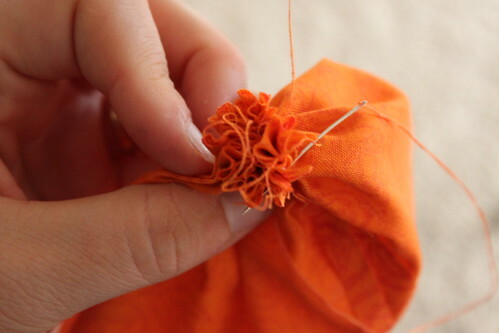 Fold the fabric in half (right sides together) and then draw on a stem. You want it wide enough to be able to stuff it. 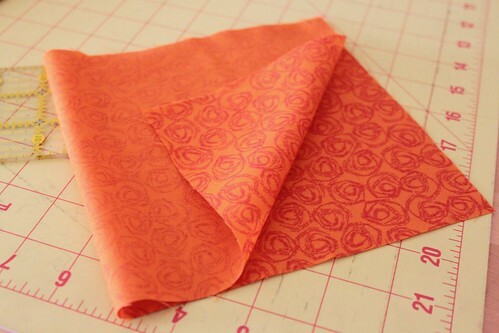 Next sew along the stem drawing. I don't actually draw on all of mine. I just eyeball it. But, if it is easier for you to draw it on all of them go for it. Do what is easiest for you. Trim it down and then turn it right side out. This is how I do it. It should look similar to this when you are done. 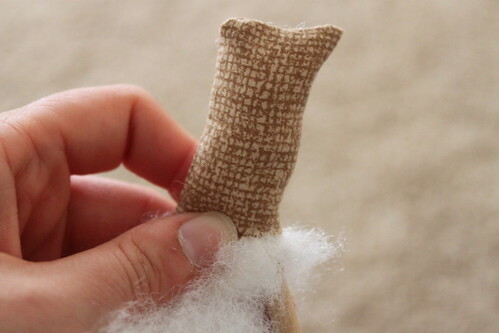 Next, stuff it with the fiber fill. 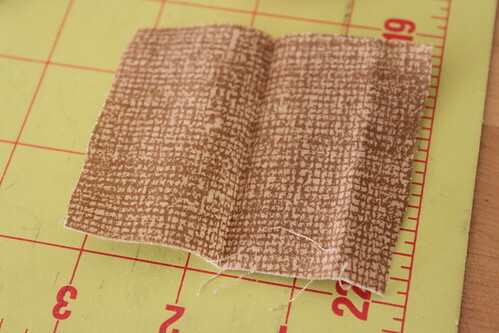 Then sew the bottom shut. You can do this on your machine (like I did) or by hand. It is up to you. It doesn't have to be pretty. 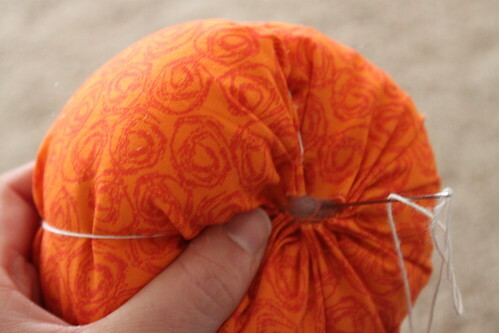 It is just keeping the stuffing inside. 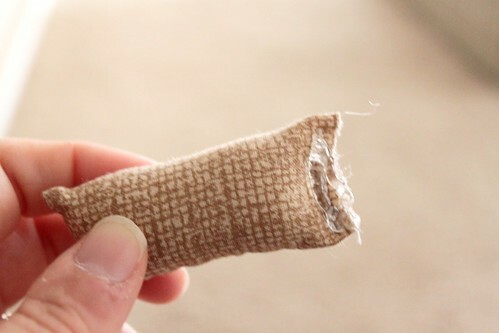 Grab your hot glue gun and glue (make sure it is warmed up) and put some glue on the bottom of the stem. Then stuff it down into the pumpkin. Aren't they all so cute? Oh, I just love them. Pumpkin Happiness. Then lastly grab some raffia and tie on a bow. Have fun making them! Happy Fall my Friends. Tasha, these are DARLING!! :) I love them. so cute. geez you made a LOT of them. send 2 to me and save me the work! ;) heehee! 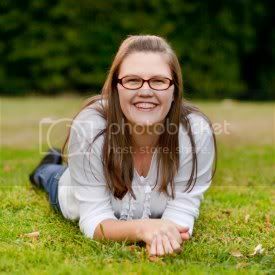 I just did a tutorial very similar to this one. Great minds must think alike. :) They really are super easy and oh so cute. I love how you sewed the stems for yours. Darling! Oh my gosh, these are adorable! Thanks for sharing! :) I've just pinned you! These are so, so cute!! 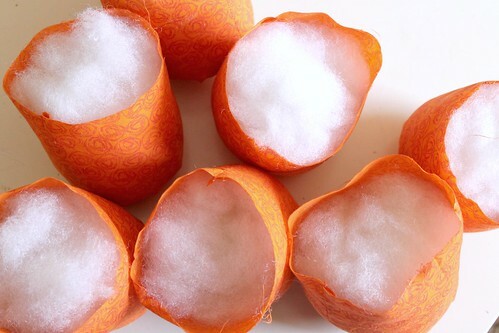 I just saw them featured on tatertots & jello's 22 Pumpkin Ideas... wahoo!! My pumpkin cupcakes with salted caramel buttercream are there too!! Yay for Fall and pumpkins! I'm your newest follower! thanks for this tuto, it might be very easy. Love! 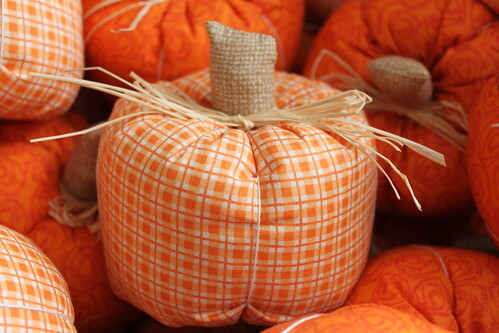 I would be thrilled if you linked up to my Wickedly Creative Halloween Ideas Party. These are super duper cute! I love how simple it is to make them. Thanks for sharing the tut! Very, very cute! I really like them and how full and plump they are. I love LOVE these! I featured you over on my blog. Feel free to stop by and grab a button and thanks for linking up to POV. I hope you'll join us next month as well! Thank you for sharing this, these are so cute I love them! 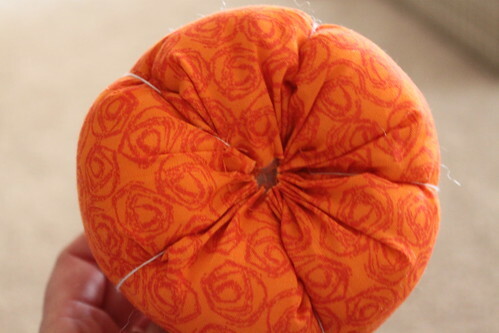 I saw a tutorial for pumpkins the other day somewhere but got put off cos it involved 8 panels of fabric and a lot of sewing and clipping haha! 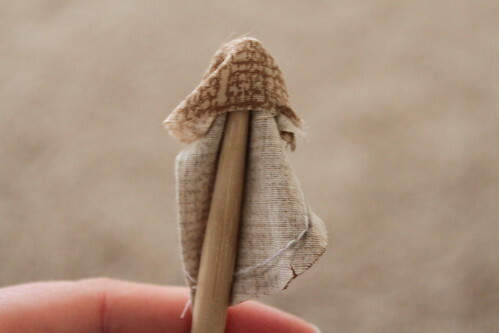 These are so simple and effective even I have the skills and time to make them! Fab!! Tasha - thank you for this tutorial. 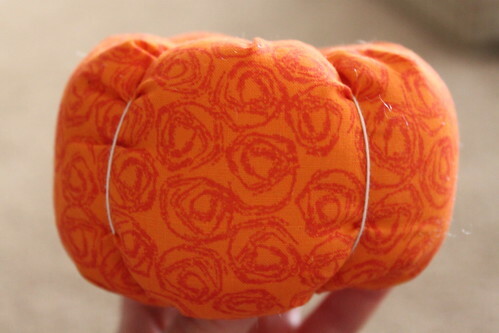 I just made 4 pumpkins for a baby shower I'm hosting and you covered every step I needed!